Dog Park Safety | Train Positive Dog! Today’s topic was inspired by Sue Sternberg, dog behavior expert and innovator in shelter dog welfare. Sue presents excellent seminars on dog aggression and dog park safety – I urge you to attend if she is in your area. Dog parks and public off-leash areas are increasingly popular across the United States. Many dog owners relish the opportunity to let their dogs run free and play with other dogs. But sometimes, off-leash play turns into serious aggression and can cause physical or mental harm to dogs, especially in groups of dogs that are strangers to each other thrown together at a dog park. It can be difficult to see these aggressive interactions, which often occur at high speed. Self-interrupted – the players should break off and rejoin by themselves, the play should rise and fall in intensity naturally. Fun – dogs should look like they are enjoying themselves and be should willing go back to interact with a play partner. 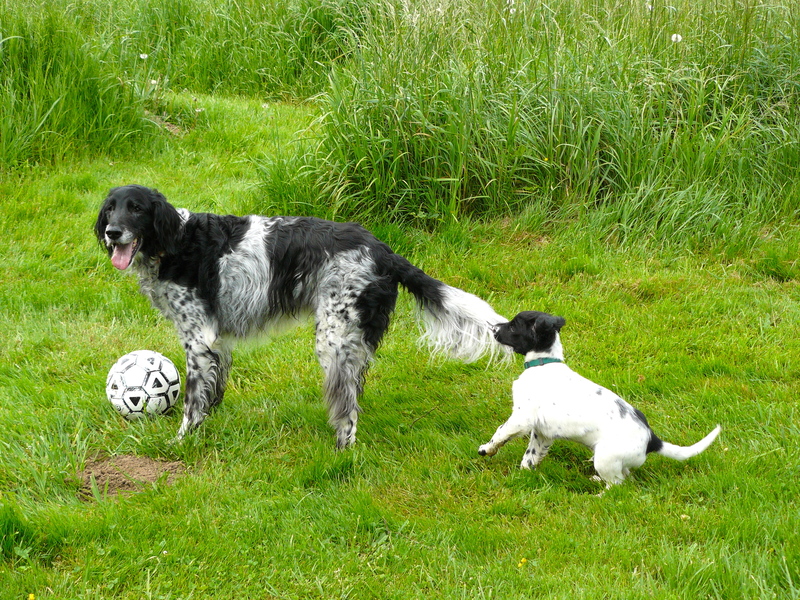 Share space – dogs should be balanced in their use of space with each other, and similar in size and play style. These two are not the same size and need careful supervision. In this case, the puppy is more than a match for the older dog! However, the puppy should not be practicing pulling another dog’s tail – not a safe way to play. Best to interrupt this, take a break, and encourage safer play. Relaxed – dogs and their muscles should look relaxed. Bodies should be curved and twist during play. Ganging up on one “victim”. Continuous action at a high level of arousal, or always escalating in activity level. Groups of dogs chasing another dog. Hanging on to another dog’s neck or tail, biting at legs. Keep a close eye on your dog when he is off leash with other dogs. If you see any of the dogs displaying unsafe behavior, leave the area immediately. People who interact with their dogs – throwing a ball, calling periodically, monitoring play with other dogs, and taking responsibility for their dog’s safety. Dogs similar in size to your dog who are relaxed and can play safely. 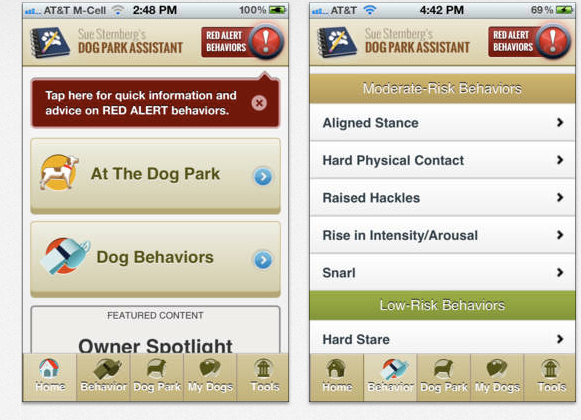 Sue Sternberg has published an app called Dog Park Assistant which has a dictionary of safe and unsafe behaviors with pictures and descriptions, tips for dog park safety and more. 99 cents at the iTunes store. Your dog should be 6 months or older. You should be very familiar with how he interacts with other dogs. Your dog should respond quickly to your recall at a distance.